Cottage 4 people - The accommodation comprises 2 bedrooms (40 m² & terrace - air-conditioned) 2 bedrooms (with 1 King-sized double bed - 180 cm x 200 cm - and 2 single beds - 80 cm x 200 cm, all with cotton sheets, blankets and pillows supplied). 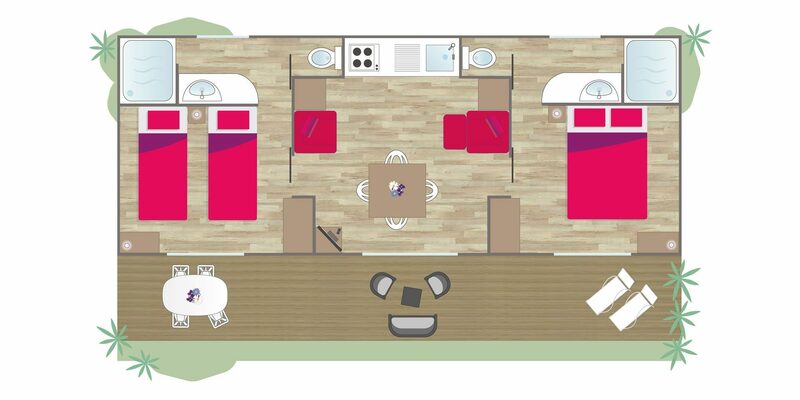 There are 2 shower rooms (including shower and washbasin, with towels supplied), 2 WCs, a fitted kitchen, with dishwasher, microwave, fridge-freezer and electric coffee-maker and a lounge/dining area with flat-screen TV. Finally there is a spacious terrace with garden furniture set and sunbeds. The accommodation also has air conditioning and a safe.